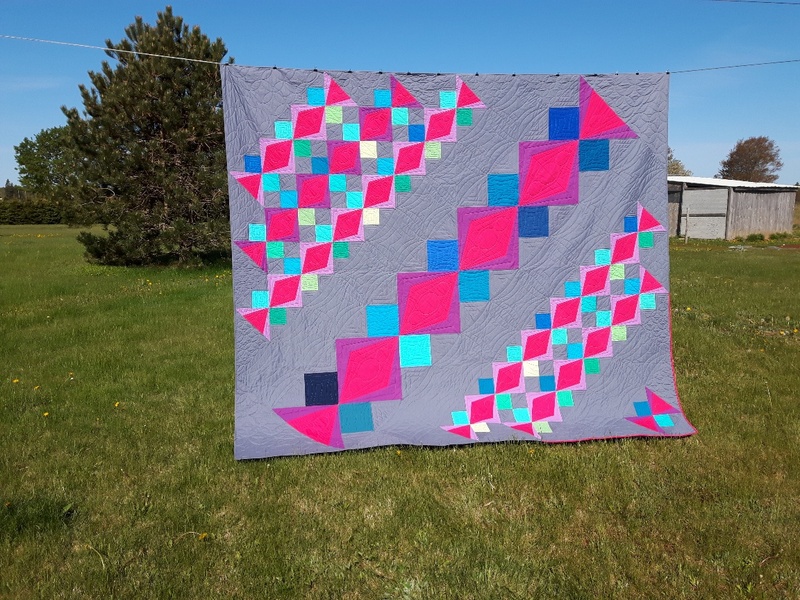 I am thrilled to share my second Make Modern published quilt- "Harlequin Twist". 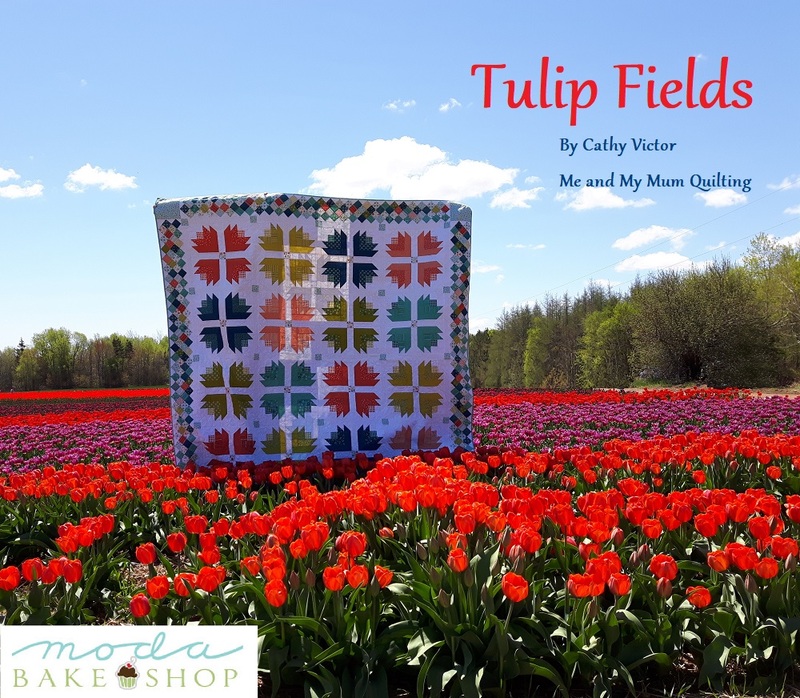 This quilt reminds me of summer days spent at the fair. The design was inspired by Merry-go- Rounds, Carnival Rides and Circus Tents. The colors were inspired by all my favorite treats.... Cotton Candy, Bubble gum and Ice Cream. Yummy!!! 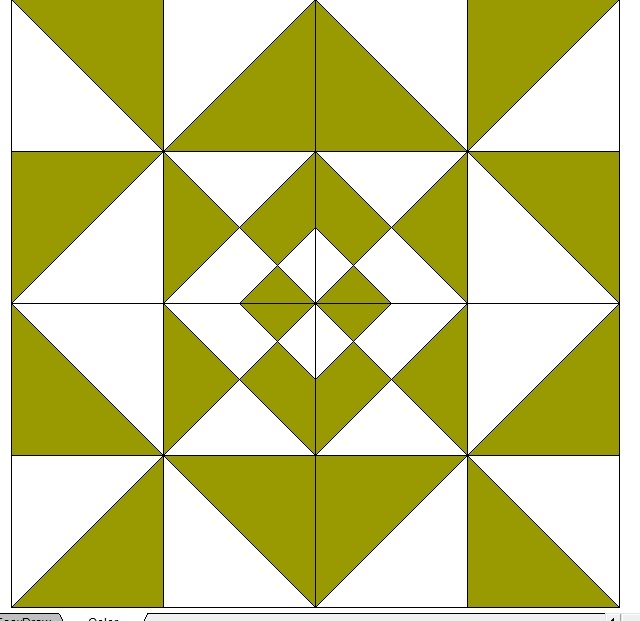 The quilt construction is much easier than it appears. The blocks can be made using the typical rulers that most quilters have. If you have a large 60 degree ruler, that makes things even easier. 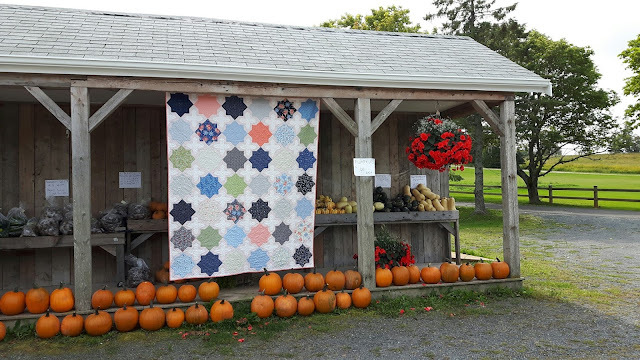 This original quilt is a king size measuring 118" x 102". Me and My Mum are working on smaller versions too, which will be available for sale once we get them finished and the patterns are printed, so be sure to check back for news on that!! If you are interested in purchasing Issue 23 of Make Modern you can do so here. 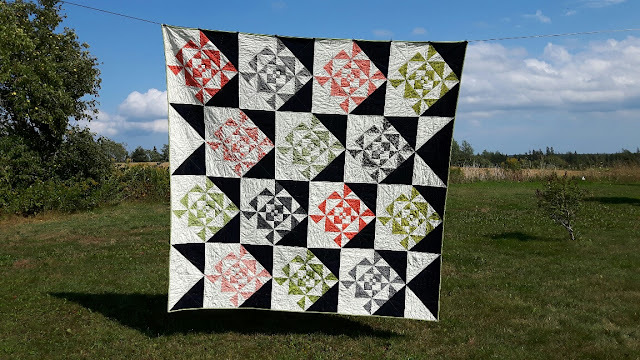 I look back to when I "re"started working on the "Sunkissed by Spring" Quilt (Nov.3 2017), and although I couldn't work on it every Friday..... 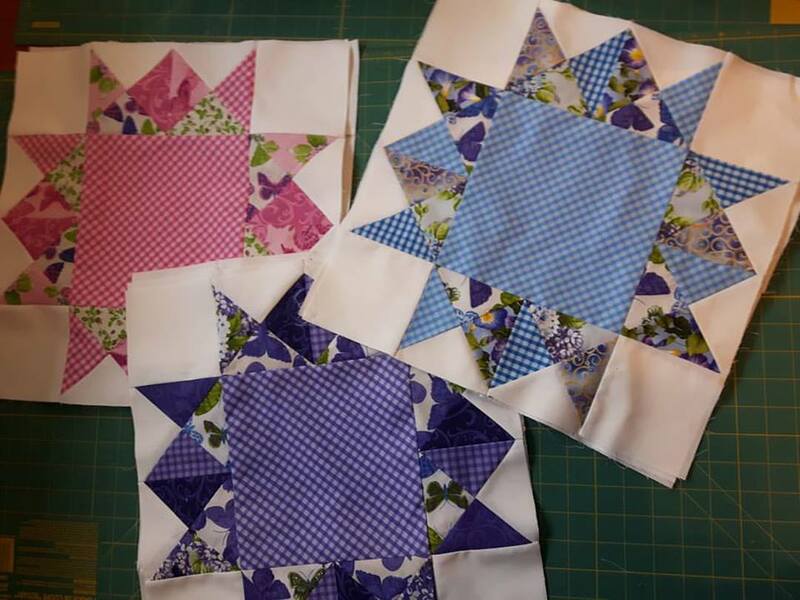 I did try my best to work on it when I was in my Sewing room and it happened to be a Friday. At long last I can say it is finally (Almost) finished!!! It's a completed Quilt Top and that is good enough for me!!! 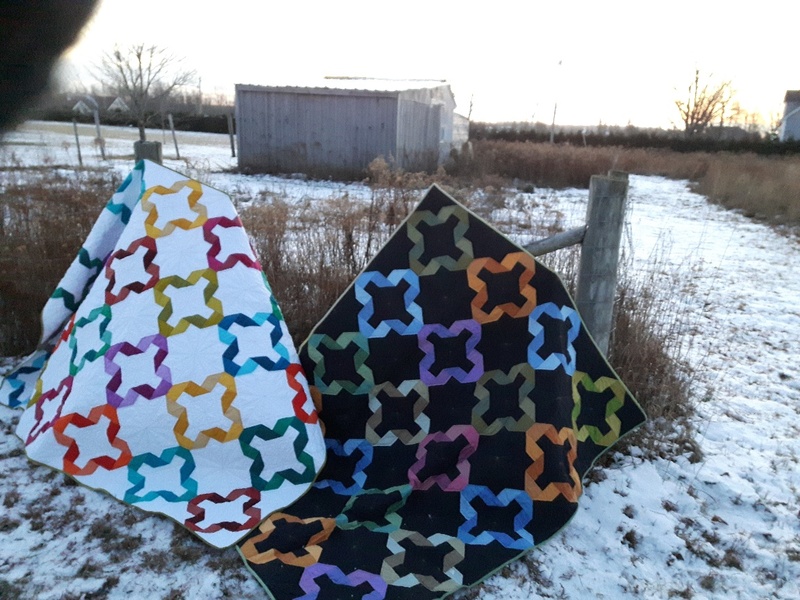 I literally have a closet full of completed quilt tops, but they don't bother me as much as the bins of half started blocks. 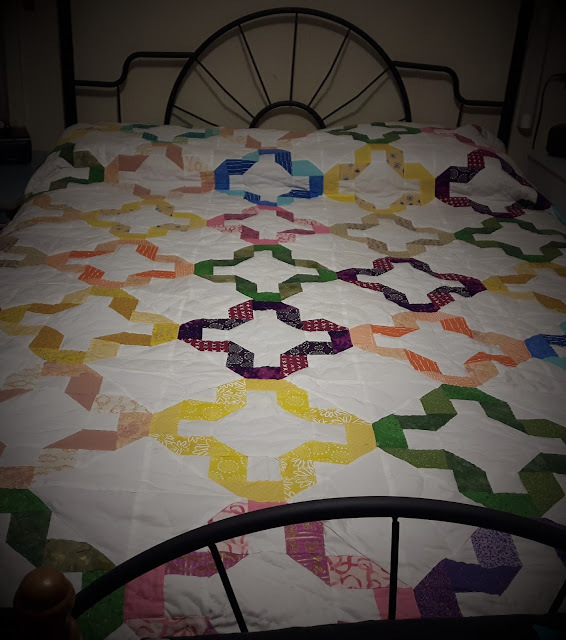 It feels good to finally have this quilt top assembled!!! 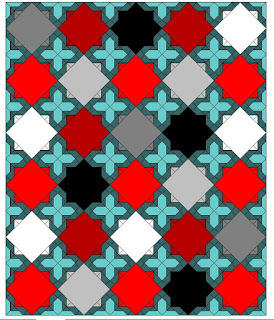 I loved the pattern as soon as I saw it, but the fabric I ordered just wasn't that great. Don't get me wrong I loved the designs on the fabrics, but the cotton felt quite thin. So, it went into hibernation or a time out, I don't know... I just wasn't ready to deal with it. 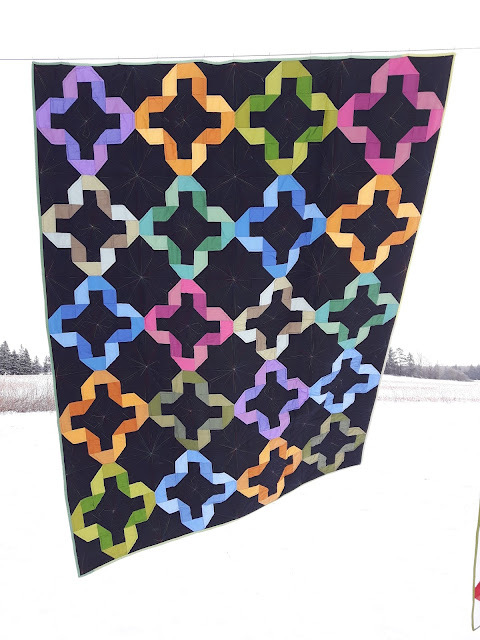 But it occurred to me that I paid $$$ for that fabric (poor quality that it was), and it was pretty after all, so I brought it out of solitary confinement and thought to myself " hey, you've been wanting to learn how to Free Motion Quilt, and it's not like I'm going to be any good in the beginning. Why not have a not so important quilt lying in wait for the day when I want to tackle FMQ'ing an entire quilt, but won't be crushed if it doesn't turn out as awesome as I want." So that's the plan. 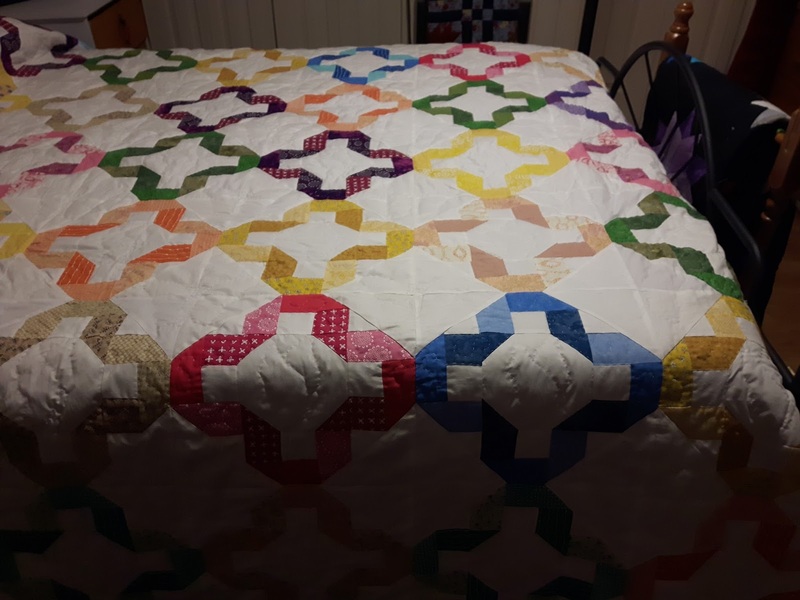 It can go into the closet and I know it will be there waiting for me when I am brave enough to jump in to Free Motion Quilting an entire quilt. Don't think that I have been keeping my Mum from having "Finish it up Friday" fun. We worked on these blocks together over the last few months and hers is so close to finished.... She noticed one of her blocks had an oops, and she knew she wouldn't be able to unsee it, so after she fixes hers up I will post a pic of hers too. Hmm, what will my next FIUF project be??? 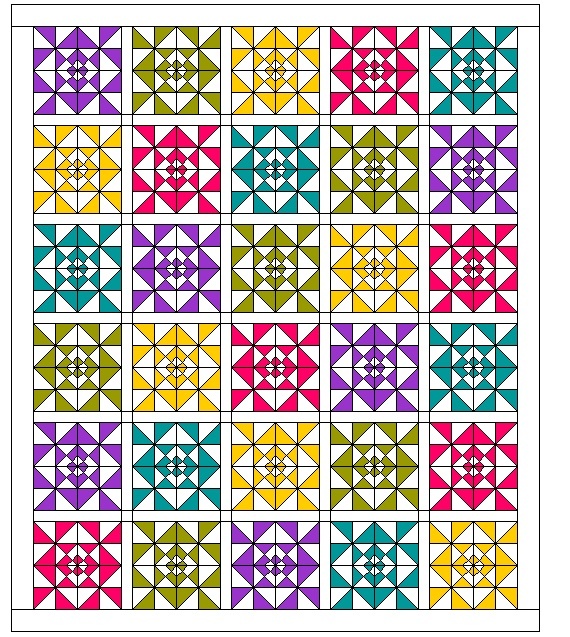 I have some quilty obligations to see to in March, so we will see. Be sure to come back to see my Mum's "Sunkissed by Spring" and in March I will have a fun project reveal to share that I've been keeping secret!! Welcome to Finish it up Friday!!! I don't know about you, but I have a lot of half finished projects. I start out strong and then oh look, SQUIRREL!!! 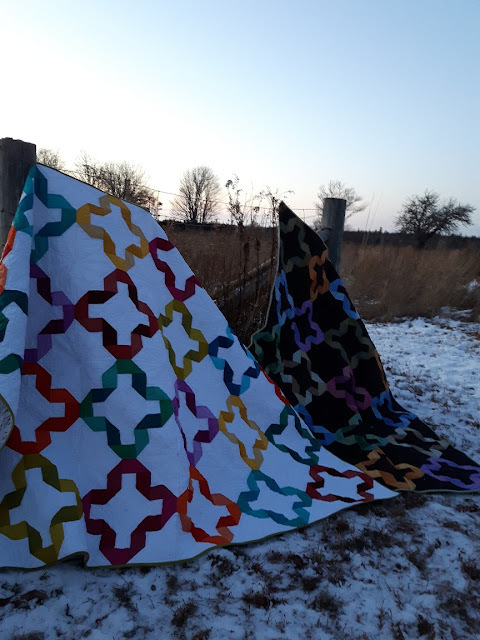 LOL, but really what with pattern designing, and writing, and hosting a Quilt-Along, and the fact that My Mum is a faster quilter than me, I have accumulated several totes of projects in various stages of completion. I'm not talking about completed tops (I have a ton of those too). So in an effort to free up some totes and move things from one pile to another, I have decided that on Fridays I will pull out an unfinished project and work on it on Fridays until they are completed tops and the tote is empty. 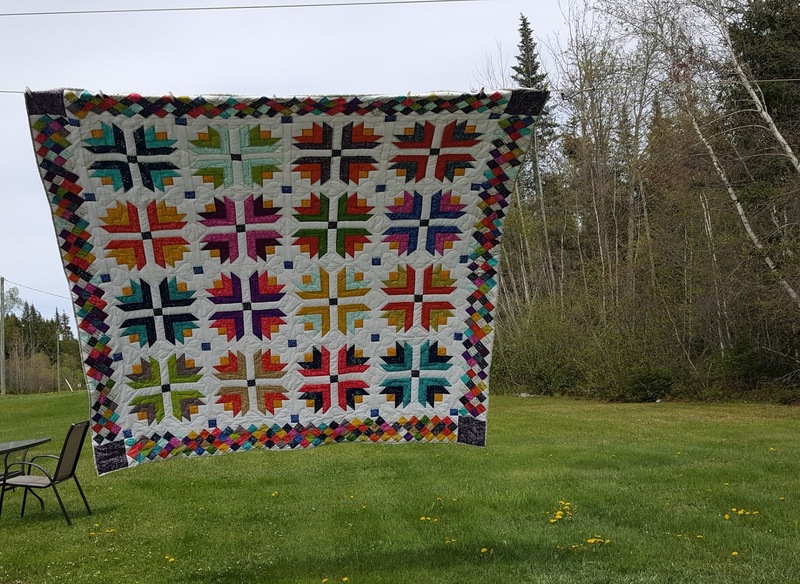 I hope you will join me on my journey to free up some room and cross some long standing projects off my list (so I can start more, LOL). Maybe even consider finishing your own unfinished projects. Just 24 left until we can start putting the quilt together. 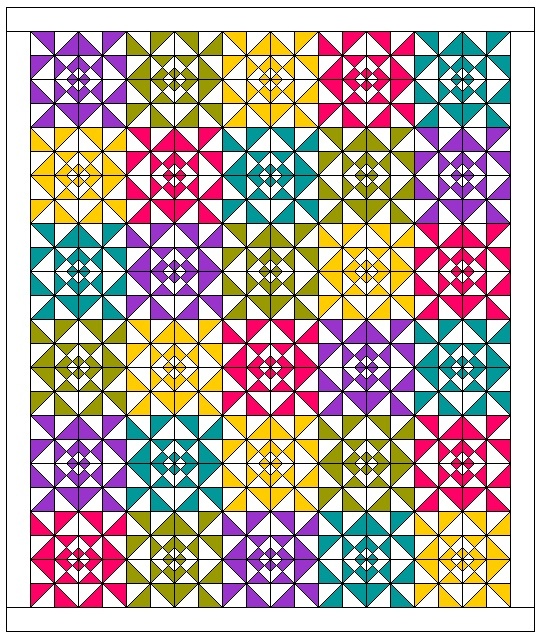 Feel free to share your progress with me and I will post it here along with our progress for "Finish it up Fridays!!! Hi everyone, I am so pleased to share another Modabakeshop tutorial with you today. 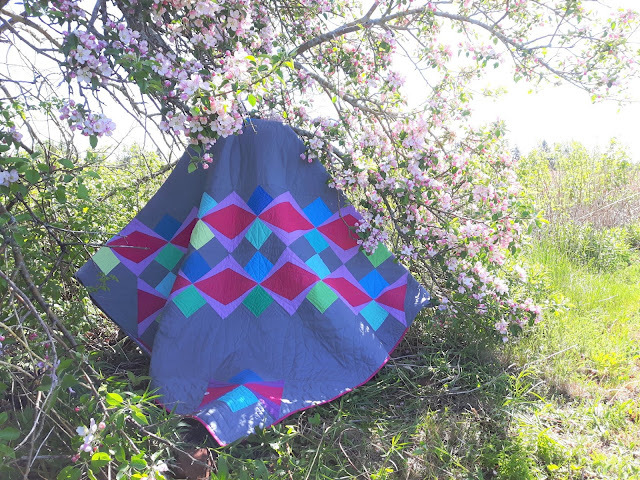 I call this quilt "Web Weaver" because I felt like a spider making a web as I went around and around this block. 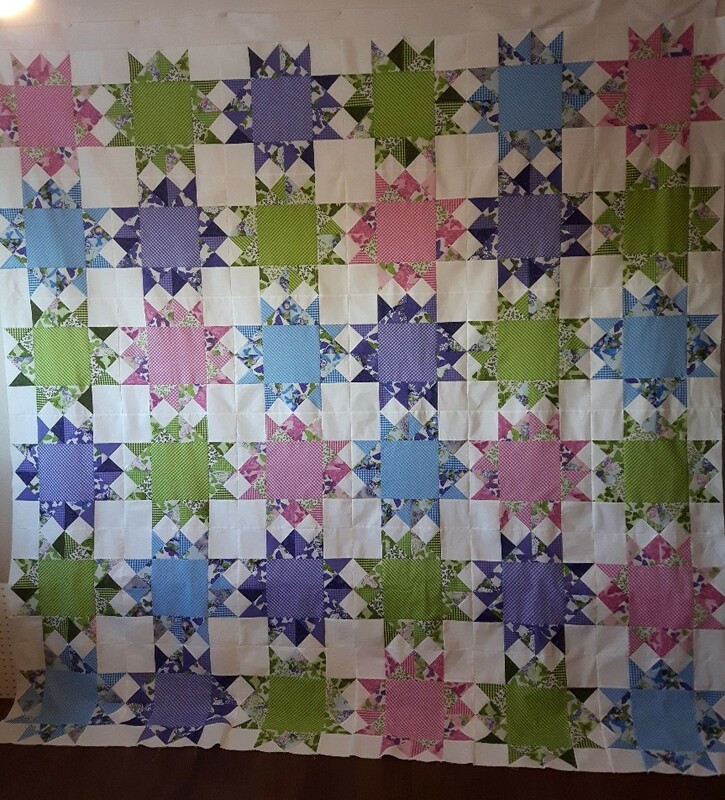 It is a very big block, it finishes a smidge over 22 1/2". 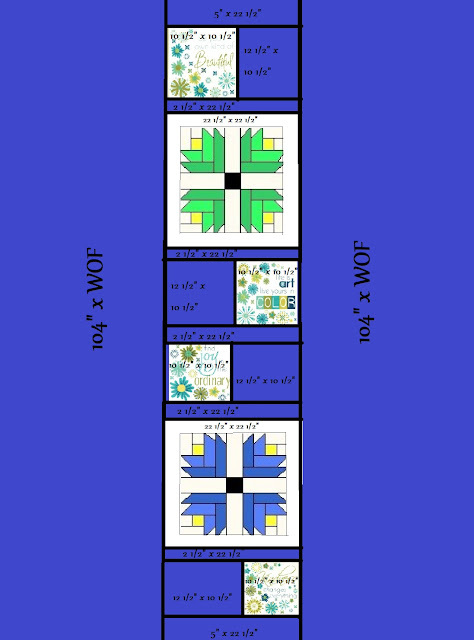 (That's with the setting corners on it). The block is 16" finished without the corners and alternatively you could just focus on the centre of the block for a 8" finished block. Lots of options to play around with!!! I have also decided to add a few other layout options that I played around with while designing this quilt/block. This block looks really complicated, but as long as you take care to match seams, it actually comes together quite nicely. 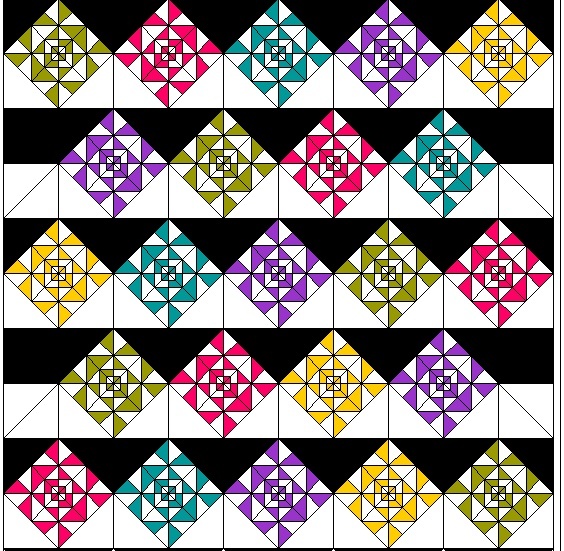 I'd love to see any blocks/quilts that you make using my tutorial, or if you have any questions, feel free to contact us using the link in the "Contact Us" tab.